Is their a connection between the WW and OoA? I thought it was really obvious... Green/Farore, Blue/Nayru, Red/Din, it's been that way since OoT. 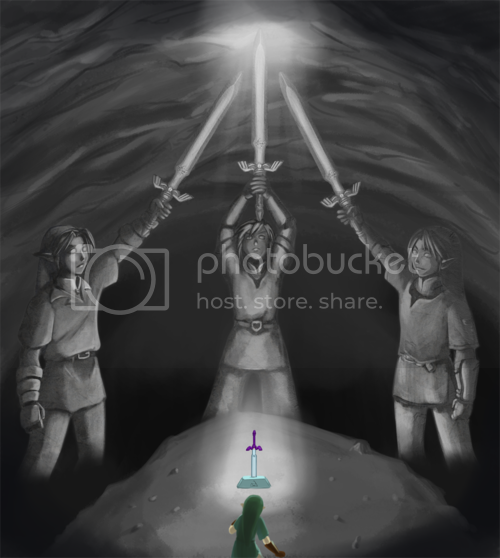 Din, Farore and Nayru WERE still godesses in TWW as it takes place in the same world as OoT, obviously. Therefore to open the TOWER OF THE GODS (Geez, think here people) you need the pearls of the GODesses. The Godesses also played roles on OoA and OoS, thus these symbols appearing there too. The Godesses also played roles on OoA and OoS, thus these symbols appearing there too. The Godesses weren't in OoA and OoS. There were three women Oracles who were named after the Goddesses. I don't think they were the goddesses themselves. I think there would be a reason why they had the same colours and names though. Hmm? Take out your map of the Great Sea. Now take out your Hyrule map from OoT. Do you see that where hyrule castle is in the Great Sea( Tower of the Gods) every thing fits into place with the OoT map. Forest Haven ( Lost woods in OoT map) is to the South-East. Hmmmmmmm, its like that on the Oot map too. And Dragon Roost island( Death Mountain) is to the North east, or East on both maps. It may be spread out a little but the maps show resemblance. So the rest of the sea may be Holodrum and Lybrana.